The ASCE 7 Subcommittee on Wind Loads is tasked with the not insignificant role of codifying the procedures by which engineers calculate wind loads on buildings in most of the United States. 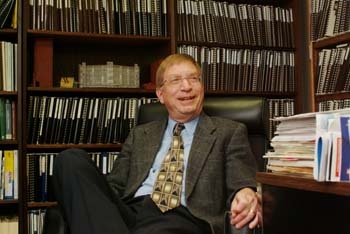 In the mid-1980s, the Subcommittee was limited to one member per organization, and Jack Cermak served as CPP’s delegate for years. But as Dr. Cermak’s alternate, Dr. Peterka filled in when Jack couldn’t attend, and he made major contributions to the group well before achieving full membership. Peterka was instrumental in the decision to shift the basis of the wind code from what is known as a fastest mile wind speed to a peak gust wind speed. The nomenclature may be unfamiliar to those who don’t work in wind engineering on a day-to-day basis, but the distinction is considerable. Designers around the world now use the peak wind gust when they estimate wind loads on buildings and structures. In 1995, Peterka’s contributions heavily influenced the development of the wind map for non-hurricane regions of the United States. The new map greatly simplified how engineers determine design wind speeds for locations around the country and consequently reduced confusion and improved code compliance. The national wind map remains largely unchanged to this day. Jon also chaired the ASCE-49 Standards Committee on Wind Tunnel Testing, which publishes Wind Tunnel Testing for Buildings and Other Structures. This document defines the best practices and standards that must be followed to accurately measure wind forces in a wind tunnel simulation. Peterka’s work with ASCE-49 also led to the inclusion of a chapter on how to use wind tunnels to estimate snow loads, a valuable service that has served CPP’s clients for many years. Through his tireless contributions to ASCE, Jon Peterka has had a significant impact on how modern wind engineering is practiced. Dr. Peterka’s retirement from CPP may mark the end of his official role with the company, but it hardly heralds the end of his career. Jon will serve CPP as an expert consultant from time to time, and he will continue offering expert testimony in legal cases as he has for many years. As a world expert in wind loads on shingles and low-rise buildings, demand for Jon’s legal opinions shows no signs of abating. But it’s not all work and no play. For more than thirty years, Dr. Peterka has enjoyed writing poetry, and he plans to use some of his newfound free time to finally realize its publication. Never one to shy away from complexity, Jon plans to self-publish his work and see it through every step of the process, including formatting and illustration. We at CPP are honored to have worked with Dr. Jon Peterka for more than thirty years, and we trust that his years of retirement will be every bit as distinguished as his years with us.